Muscle recovery is extremely important for athletes. 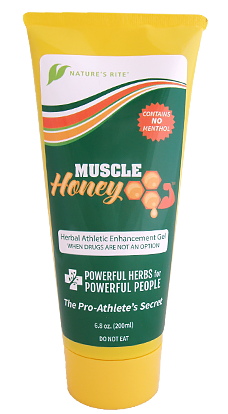 That's why we created the Muscle Honey sports gel. Its blend of herbs will have you back on the field sooner & performing on top of your game. 13 Years ago I had an L 4-5 Fusion after finding out I had broken a vertebrae and ruptured 2 Discs. The Surgery was not a 100 percent success and left me with years of chronic pain. I do not take Prescription Meds for many reasons so was always on the search for a Natural Product. After trying their “BST” for the first time I was sold ! Now there is rarely a day when I do not put it on first thing in the morning along with their Muscle Honey and I am able to move throughout the day!